Welcome to Herne Bay Mr Farage. 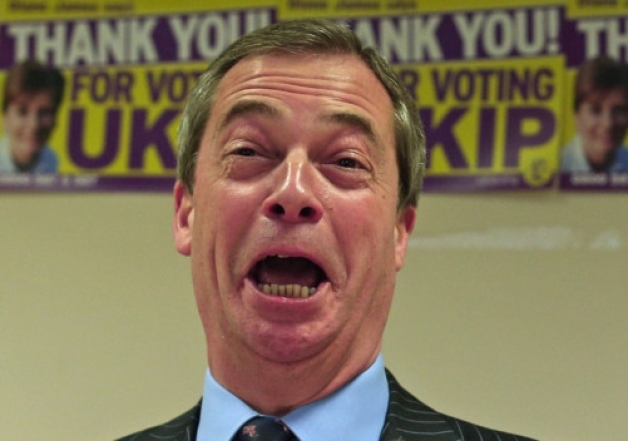 Nigel Farage is in the Bay tomorrow so I should probably say a few words of welcome. In case you hadn’t noticed, there’s also a bloody big wind farm off the coast. You might think it’s an eyesore and a waste of money. I think that given North Sea oil and gas production is falling at around 10% every year and is going to continue to do so, having a bit of “British” wind powering the country is a good thing. Zero fuel costs, zero emissions at the point of production, helping reduce global warming…. I’d personally like to see turbines getting manufactured near here; it would create some welcome jobs. Guess we’ll just have to disagree on that. That broken pier head? Those local Tory councillors I was talking about are happy to watch it get washed into the sea. Your candidate for Thanet North, Piers Wauchope, was kind enough to make the long journey down from his native Tunbridge Well, where he’s a councillor (and like so many UKIP hopefuls, a former Tory one), to a meeting I helped organise on trying to arrange its regeneration. He left early and didn’t say a word, but it was good of him to pop by. Herne Bay was a long way for him to come. Thanks though Piers! The Green Party, of which I am a meat-eating, red-blooded member, would bring the railways back into public ownership and stop this relentless asset-stripping that you, in government, as a former City trader and with your Hedge Fund friends funding your party so enthusiastically, would no doubt be delighted to see continue. The Royal Mail used to be just that, her Maj’s. Now it’s gone the way of the rest of the family silver. Southern Water? Owned by infrastructure funds that have no interest in upgrading infrastructure – but aren’t averse to pumping sewage into the sea. Haven’t heard a peep from you on these issues, nor your candidate. Just immigrants, immigrants, immigrants. Did you know there used to be a small charity in Herne Bay that looked after women who were fleeing violent relationships? It only needed a tiny bit of funding, but because of austerity, it was forced to close. Nobody really even said a peep; banks can have their liquidity problems solved with billions in state support, but small local charities, or mental health services face their funding being hacked to the bone, firefighters having their pensions put at risk? It’s a bloody disgrace and I don’t hear anything from your mouth that suggests you care about anything other than blaming hard-working, resourceful people trying to build a life for themselves for the country’s woes. Eh up. Mustn’t grumble. It’s a free world. Like I said. Enjoy your visit. It’s good little town!